This was posted on April 9, 2018 by Sarah Maxwell. Happy Monday! I hope your week has started off well. I love mochas, and the question has been posed on how I make mine. I tried to be quite detailed for your sake, but it’s not hard at all. Feel free to leave me a question in the comments below if you need clarification on something. At the end of the post, I’ll include links where each of the items can be purchased, but you don’t need the exact products to make something similar. For your reference, this makes about a 16 ounce mocha. To begin with, add some hot water to your cup (several inches’ worth). I’ll explain why in a moment. Next, heat water to 190 degrees. We have a handy Cuisinart that does that. 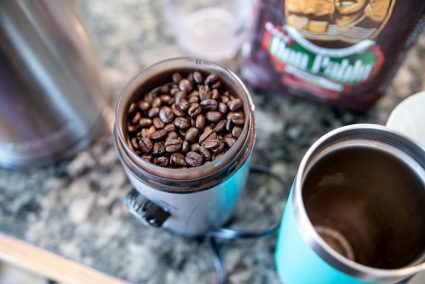 Grind coffee beans. Dump out the water in your cup, and add about 2 TB. chocolate syrup (more or less depending on how sweet you like your drink). 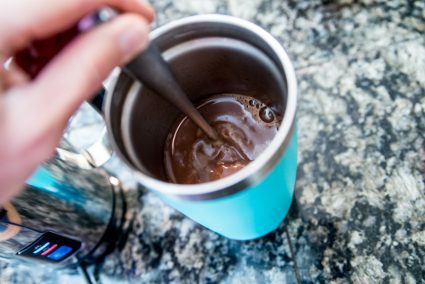 The hot water warmed up your cup so the syrup will be more room temperature if it’s been refrigerated. You can use my recipe here, or any kind of syrup. I’m a fan of peppermint mochas and often use some peppermint syrup in mine (so in that case, I would do about half chocolate and half peppermint for flavoring). 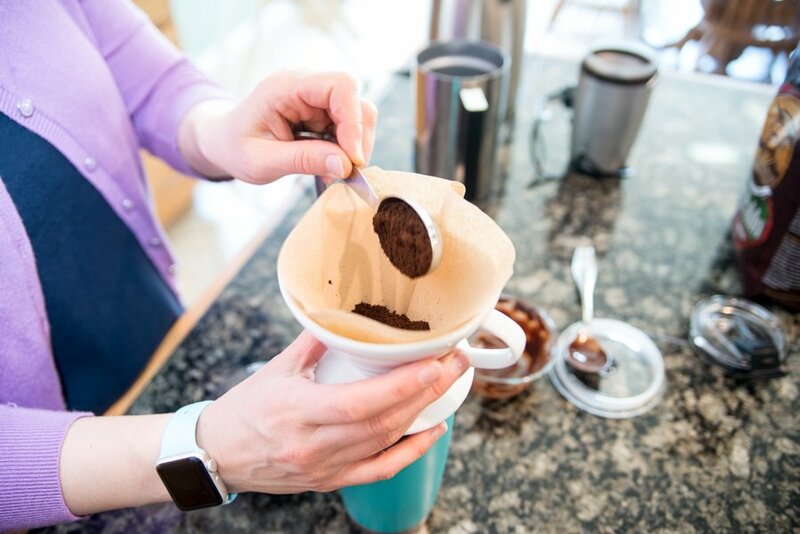 Now put your paper filter in the pour-over cup, and add 2 TB. freshly ground coffee. 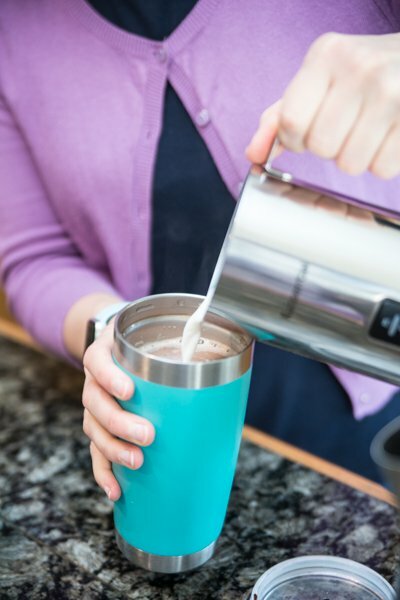 To make the most of your time, pour milk into the frother. I love using whole milk, and I pour to the max line which is 8 ounces. Next, pour hot water over the coffee, ensuring all the grounds get a nice amount of liquid. As the liquid drains into the cup, add more water. Lift up the white pour-over cup and check the liquid level. I aim for about half full. I let the water-coffee mixture not quite drain out of the pour-over and then set it in the sink. I read somewhere that if you let it all drain into your cup, it’s kind of bitter. Stir the coffee and chocolate. 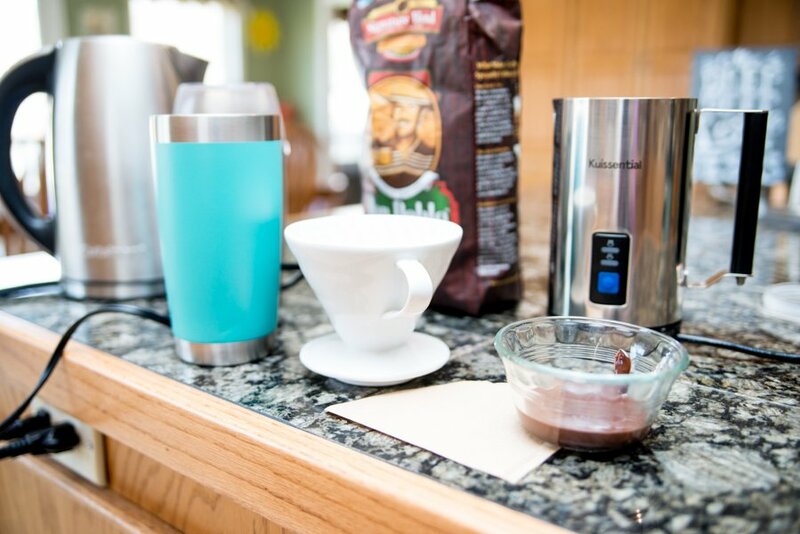 The frother should be done, so simply pour the frothed milk into the coffee-chocolate mixture. Top with whipped cream for an even sweeter experience. Kuissential Milk Frother (important note: I’m sharing this because it’s what I use, but to me, it’s not an outstanding product. You have to make sure to clean it really well, as milk sticks to the bottom, I guess due to the heat. Even if it’s cleaned, the milk will build up. Last fall, when I went to purchase a frother, this seemed middle of the line price wise, and I didn’t want to spend a lot. The price has gone up about 20% since I bought!). Simple Modern 20 oz. 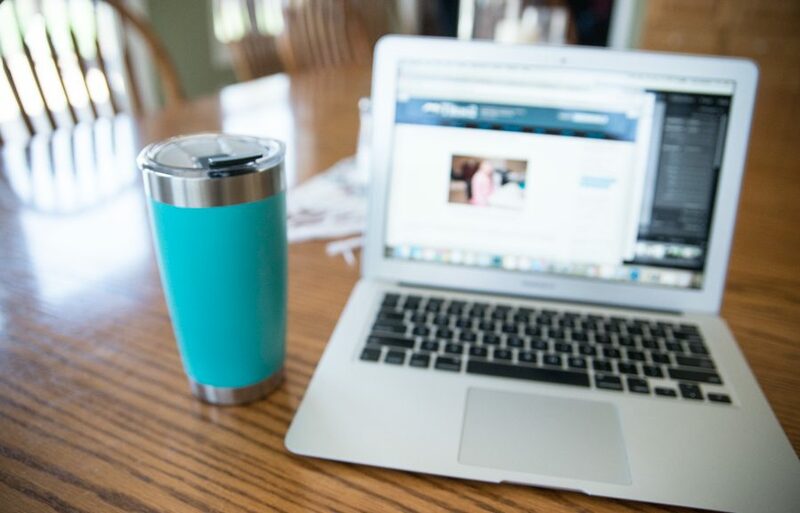 Tumbler: this is a favorite for me, and it comes in tons of colors. Some of the colors are $2 or more off, and the price extremely reasonable. The lid it comes with has an opening, so I recently purchased a closeable lid, and I like it. Again, the items I use are not necessary. You can figure out substitutes if you want, even using brewed coffee instead of the pour over method. The grinder and the frother would be the two biggest expenses. You could simply heat your milk if you prefer or use already ground coffee. Thanks for sharing! You read my mind!! I was going to pose the question as to how you make your mochas!! What a great way to “perk up” our Monday morning, Sarah. It is snowing here in VA, so a mocha is definitely in order. Our milk frother was a mid range priced one and it failed after 3 months with no customer service. I decided to get a Nespresso like we had in Australia. It failed after 3 weeks, but the company sent me a new one within a week and it’s been going strong with HEAVY use for over a year(we take our morning bevvies hot year round). 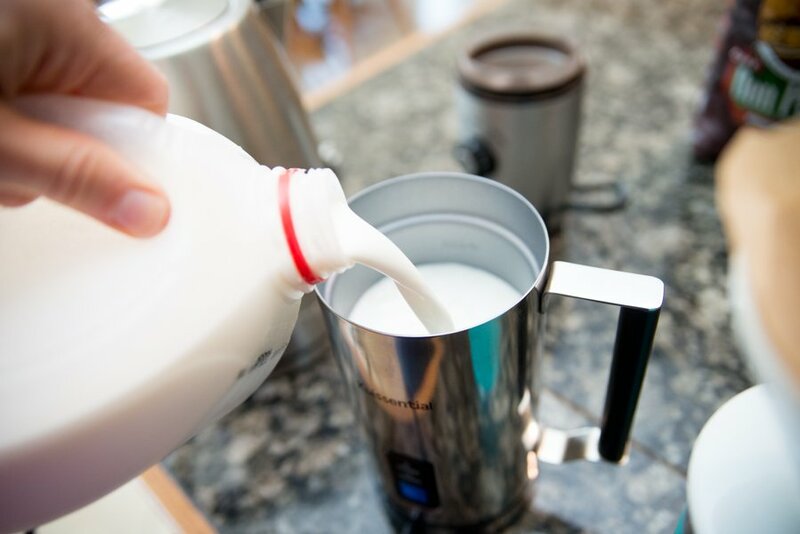 Some milk does stick to the bottom occasionally, but it’s super easy to clean. Thanks for the yummy “recipe”. Thank you, Sarah! I’m excited to try this. I like the step-by-step directions too. Thanks!! It’s not complex, although as I wrote it out, it seemed pretty detailed! But I figured the extra info might help. We do not have a frother so we warm the milk and then use our immersion hand blender to froth the milk. The result is excellent! Thank you for sharing your recipe. Great tip on the milk! Thank you for sharing your recipe! 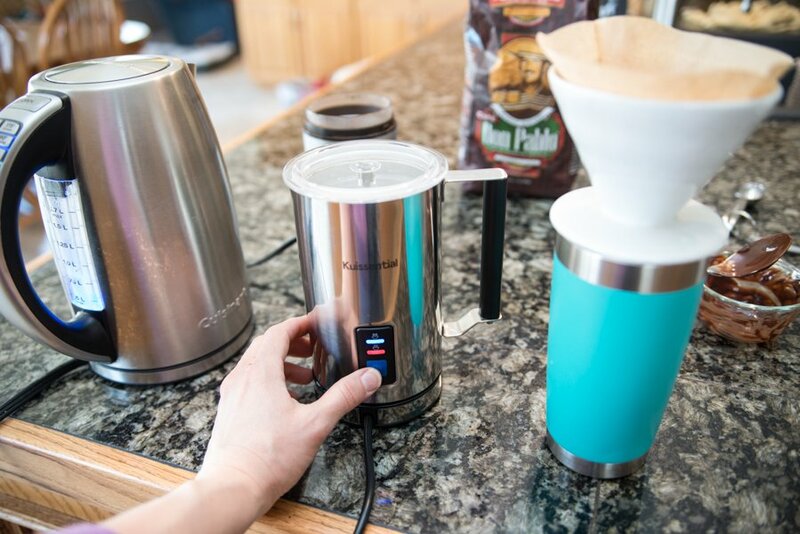 Which Cuisinart hot water kettle do you use? I’ve been looking at getting an electric kettle. When I checked, it seems to be this one from Amazon. That’s Titus2’s affiliate link. Do you ever drink them iced? If so, how does your recipe vary? 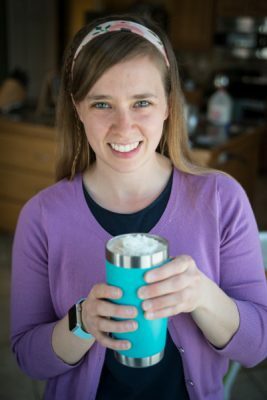 I do drink an iced coffee in the summer, but it’s very different from this recipe! 🙂 Maybe some time I’ll share it when I perfect it later! IKEA sells a little battery operated frother for about $2. It works great and is so compact I even take it on camping trips. That’s great! A wonderful tip. Yum!!!!!!! I need one right now. 😀 Looks so good! 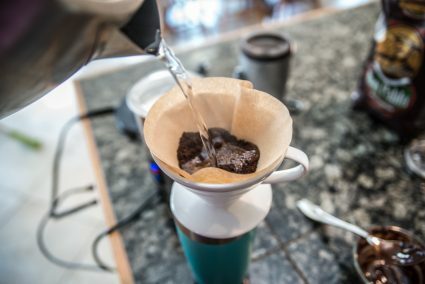 We do pour over coffee at home too. If you want to avoid guessing (and peeking under the brewer) at the amount of water you need for brewing, get an inexpensive digital scale! You’ll get a much more consistent cup of coffee that way. I consistently see a recommendation of 16:1 (water:coffee). My husband does 400 grams of water to 25 grams of coffee. I like it better at about 400:22. If your scale doesn’t have grams, you could do one to two tablespoons of ground coffee for every six ounces of water. I have enjoyed your recipe so much. Maybe a little to much recently. When you feel so inclined please share your ice coffe recipe. Many thanks. I’m so happy to hear that! Sure, I’ll work on the iced coffee when it gets a little warmer.